Bingo @ Bingo Cards .co .uk - Bingo Cards, Bingo Offers, Bingo Games and Bingo Card History : Explained. Understand the background and variations of bingo cards and bingo tickets used in the UK, Australia, United States and Canada. Understand the basics of the bingo game. Learn the differences between the two major bingo game variations. Read about bingo history and the interesting story of its origins. Understand the connection between bingo games and lottery games. Bingo is a game of chance, where players hope to match numbers that are randomly drawn - and called out by a neutral party - to those they possess on a pre-printed bingo card. Each time a ball is randomly drawn, you need to check your Bingo Card to see if the number is present. If it is then you need to use a marker to block out that number. If you are playing multiple bingo cards then you need to do this for each individual bingo card. The aim of the game is to block out all the numbers on your bingo card before anyone else in the bingo room. 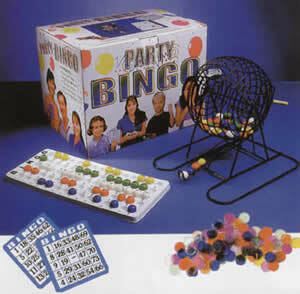 In a multi-player game the first person to say “BINGO” wins! Once someone has shouted "BINGO" then the game is paused while their bingo card is checked to ensure that all the numbers are present on the bingo card. If all the numbers are on the bingo card the the person who called is given the prize for the game. This is usually cash, but can sometimes be a prize such as a Holiday or a Television. For something so simple as a grid of numbers, it is amazing that there are variations in bingo cards at all. Perhaps not so amazing or unexpected, the North Americans and British are separated by a common game. The New Worlders use grids of 5 by 5 and play with 75 numbers, while the Brits and Australians have historically used 9 columns and only 3 rows with 90 numbers. You say tomato, I say potato. 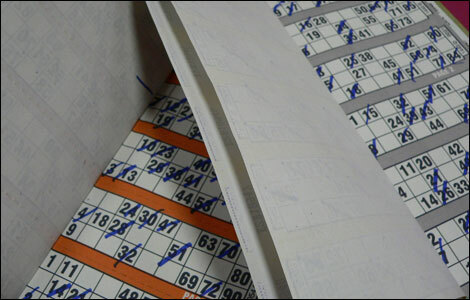 The traditional bingo cards used in the UK and Australia come as a group of 6 or 10 “tickets” in a book. Each bingo ticket contains a grid of 9 columns and 3 rows containing 15 numbers, five per row, with the remainder of the 27 spaces blank. These cards are used in a 90 number bingo game, where the numbers 1 through 90 are used to populate the cards. On each bingo card, numbers are placed in columns by group. The first column will contain the numbers 1 through 9, the second 10-19, the third 20-29, and so on. The ninth column contains the 80’s series plus the number 90. Any number may appear only once on any given bingo card. In the six card book, the numbers one through ninety are used once each in the book, randomly scattered among the six cards. In this bingo game, the pool of numbers used are those from 1 to 90. They are drawn and called or displayed by a neutral, non-player or computer one after another until a winner is declared. The objective of the player is to quickly determine if his or her bingo card contains the called number and mark it in some way to indicate the match, to get matches such that they form a pre-determined pattern on the card, and be the first person to declare “bingo.” In the “live” version of the game with printed bingo cards or tickets, a pen or marker might be used to cross-out each number as it is matched. One bingo ticket or multiple tickets may be played at the same time. Numbers are normally drawn and called quickly, so the number of bingo tickets one can review before the next number is called is naturally limited. Playing the maximum number of tickets that can be used effectively during a game increases the odds of winning for that player. The patterns used in the 90-number bingo game are invariably One Line Across, meaning the first row of numbers is crossed-out, Two Lines Across, meaning the first two rows are matched, and Full House, indicating that all the numbers on the bingo ticket are matched. Traditionally, in a bingo game there is a list of rhyming slang or nicknames given to each of the ninety numbers. These are seldom or never used in cash or serious bingo games, because they might cause confusion with some of the players, not to mention take too long to say. In the United States and Canada, the standard bingo card is a 5 by 5 grid, and 75 numbers are used in the game. 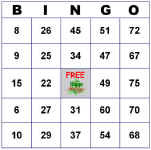 A number is not placed in the middle square of the bingo card, that square counting as filled or covered, and is usually marked “Free” or “Free Space.” Twenty four of the 75 numbers are therefore used on each bingo card. 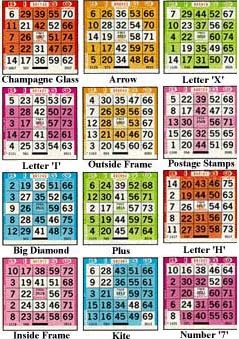 Each column on the bingo card is labeled with a letter from the word “Bingo, with the first column labeled “B,” the second “I,” the third “N,” the fourth “G” and the last “O.” The numbers 1 through 15 are randomly assigned to the first, or B column, 16 through 30 the I column, 31 through 45 the N column, 46 through 60 the G column and 61 through 75 the O column. No number may appear more than once per bingo card. The numbers 1 to 75 are used in the North American version of the game. They are drawn and called or displayed by a neutral, non-player or computer one after another until a winner is declared. When printed bingo cards are used, a thick marker might be used to daub each number with ink as it is matched, or beans or other tokens might be used to cover the number. One card or multiple bingo cards may be played at the same time. Numbers are drawn and called in a measured and continuous way, so the number of bingo cards one can review before the next number is called is naturally limited. Playing the maximum number of bingo cards that can be used effectively during a game increases the odds of winning for that player. The patterns used in the 75-number bingo game are many and varied. The simplest is one row across, one number for each letter, thus B-I-N-G-O is obtained and is enthusiastically exclaimed when such a feat is accomplished. Popular patterns include: the “X” formed by diagonals crossing in the middle square; “Picture Frame” formed by all the numbers in the first and last rows, and first and last columns, being successfully filled; “Plus” formed by the middle column and middle row..
How to Turn the Home into a Bingo Hall. Bingo cards are very popular with teachers, who are always searching for a way to “make learning fun.” They are used by schoolteachers and leaders of adult seminars alike. The general idea is for game participants to recognize on their bingo cards the answers to questions raised by the moderator. For example, the questions might concern outer space, and so the moderator would read “What do we call a pattern of stars in the sky?” Those students with the word “Constellation,” or perhaps a picture of a constellation, printed in one space on their bingo cards would cover or mark that space. In order to “win” the game, the student would not only have to complete the stated pattern, but would also have to get all the answers correct! A sample list of common subjects for which teachers have used bingo cards and the bingo game include: Letters, Numerals, Vocabulary, Spelling, Geography, Foreign Languages, Mathematics and Identification of Objects (animals, plants, countries, etcetera). For small children, bingo cards containing fewer numbers than the standard 15 or 24 may be used, a grid of 3 by 3 being common.